Speaking to Steven Michaels of InvisibleAssets.com in Steven’s weekly telephone conference call, guest Paul Rosenberg of Cryptohippie.com and author of A Lodging of Wayfaring Men spoke about Alongside Night and the upcoming movie. 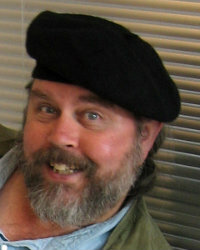 J. Neil Schulman at Libertopia 2011: Brother Can You Spare A Million Bucks? Strategic business alliance between nutritional supplement company Life Enhancement Products and indie film company Jesulu Productions demonstrates a new distribution model for indie films, where a sponsor’s sales revenues are shared with a producer, repaying movie investors. 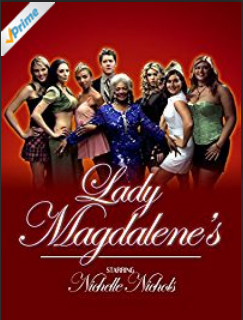 First up: Lady Magdalene’s, a triple-film-festival-award-winning suspense comedy starring original Star Trek’s Lt. Uhura, Nichelle Nichols, released for free views both on web and TV, with Life Enhancement infomercial. (OpenPress) November 8, 2011 — Most entertainment industry observers are confident that new-media distribution of movies to digital devices will become a major part of film distribution, but until now nobody has demonstrated a business model that creates a revenue stream sufficient to repay film investors. Now one indie film company is trying to create just such a digital-media revenue stream, making independent film-making once again attractive to investors by creating new profitable competition to traditional distribution channels monopolized by the interlocking cartels of movie studios, broadcast/cable/satellite systems & networks, and chain theatrical exhibitors. Jesulu Productions has just released for free viewing on both YouTube and broadcast television its triple-film-festival-award-winning suspense comedy, Lady Magdalene’s, starring the original Star Trek‘s Lt. Uhura, Nichelle Nichols, including an up-front infomercial by the nutritional supplement company, Life Enhancement Products. The strategic business alliance between the independent film company and nutritional supplement company pioneers a new distribution model for independent films, whereby the new revenue stream created by the movie’s sponsored distribution is shared with a film’s producer, repaying movie investors for the costs of production. This business model for infomercial-sponsored independent film distribution was conceived by Lady Magdalene’s writer/producer/director, J. Neil Schulman, also an award-winning novelist and journalist, who in the 1980’s and 1990’s founded and operated two eBook publishing companies, SoftServ Publishing and Pulpless.Com, which were the first companies to make books by bestselling authors available for download to personal computers, first as SoftServ in 1990 via the General Electric Network for Information Exchance (GEnie), then beginning in 1995 from the world wide web as Pulpless.Com. In Jesulu Productions’ suspense comedy, Lady Magdalene’s, Nichelle Nichols plays Maggie, the colorful and determined madam of a legal Nevada brothel — relocated from New Orleans after Hurricanes Katrina and Rita — and in tax default to the IRS. However the talented but disgraced federal agent, Jack Goldwater (Ethan Keogh), sent as the federal receiver to manage the brothel, soon uncovers evidence that Lady Magdalene’s is being used by al-Qaeda operatives as a meetup for a plot leading to the tunnels under Hoover Dam. But Agent Goldwater and a female federal agent he soon meets up with (Susan Smythe) can’t figure out what al-Qaeda is really doing until they seek help from Lady Magdalene and the working women at the brothel. Lady Magdalene’s: Free Web Edition was released on YouTube as a single high-definition video, available for web streaming or download, on October 22, 2011; and on Halloween, October 31, 2011, Lady Magdalene’s had its world television premiere on KPVM TV, Pahrump, Nevada, the town in which most of the movie’s principal photography was shot, using both familiar locations and many locals in the cast. The movie broadcast was preceded by the thirty-minute Lady Magdalene’s KPVM TV Halloween 2011 Premiere Pre-Show (also available on YouTube), hosted by cast member Mara Marini (“Nurse Gretchen”), and featuring interviews with star Nichelle Nichols, writer/director J. Neil Schulman, cast-member Mark Gilvary (who plays two different roles in the movie), and features on Pahrump local actors who were selected from a local casting call. A second thirty-minute video,Lady Magdalene’s Pre-Show, intended for TV broadcasts elsewhere, is also available for viewing on YouTube. Both the Life Enhancement infomercial and the two pre-shows were produced by Jesulu Productions. Lady Magdalene’s has won three film-festival awards: “Best Cutting Edge Film” after its premiere at the 2008 San Diego Black Film Festival; ” Audience Choice” at the 2008 Cinema City International Film Festival shown on the Citywalk adjacent to Universal Studios Hollywood; and, most recently, “Special Jury Prize for Libertarian Ideals” at FreedomFest’s Anthem Film Festival at Bally’s Las Vegas in July 2011. Life Enhancement Products is the exclusive distributor of the nutritional supplement formulations of New York Times bestselling authors, Durk Pearson and Sandy Shaw, and the infomercial seen in both the movie and the pre-show features Mara Marini interviewing founder, president, CEO, and editor of Life Enhancement Magazine, Will Block. J. Neil Schulman and Will Block have been friends since they met at a New York libertarian meeting in 1972. Block was the videographer at Schulman’s 1985 wedding to Schulman’s ex-wife, singer/songwriter, Kate O’Neal, two of whose songs are featured on the soundtrack of Lady Magdalene’s. Schulman and Block are both executive producers on Schulman’s next film production, Alongside Night scheduled to begin principal photography in December, starring international TV and film star, Kevin Sorbo (also an executive producer on the film). 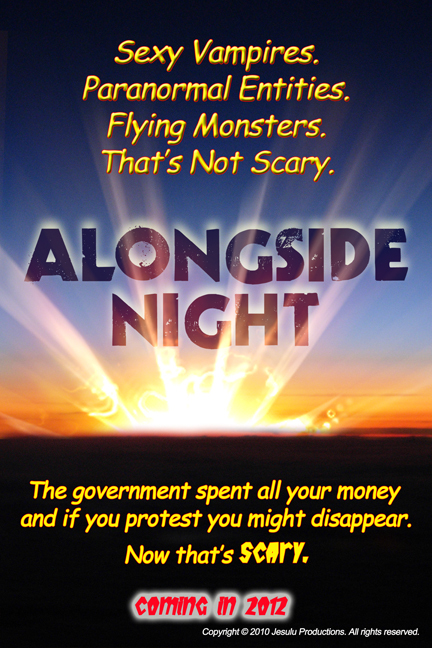 Schulman has adapted the screenplay from his Prometheus-Hall-of-Fame 1979 novel, endorsed by Nobel-laureate Milton Friedman, A Clockwork Orange author Anthony Burgess, and presidential hopeful Congressman Ron Paul, and Schulman will be helming Alongside Night as his second feature. Schulman has referred to Alongside Night as his “1979 novel ripped from today’s headlines” as it follows the teenage son of a Nobel-prizewinning economist through a U.S. facing fall of the United States government due to the hyperinflationary collapse of the U.S. dollar. 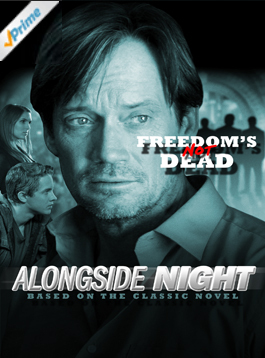 The movie is scheduled to premiere on the campus of George Mason University in Spring 2012, sponsored by campus organization Mason Liberty and AntiWar.Com. Full information on Lady Magdalene’s is on the official movie website at http://www.ladymagdalenes.com. The official Lady Magdalene’s Facebook Page is at http://www.facebook.com/ladymagdalenes. 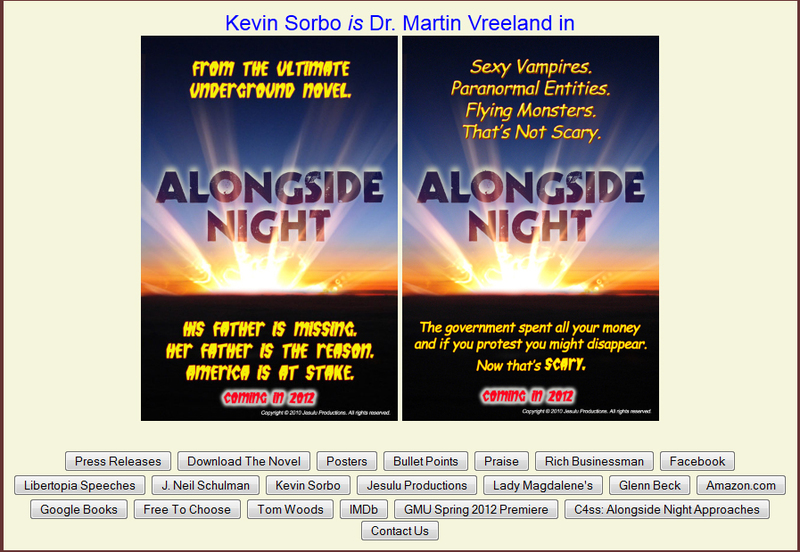 Full information on Alongside Night is on the official movie website at http://www.alongsidenightmovie.com. 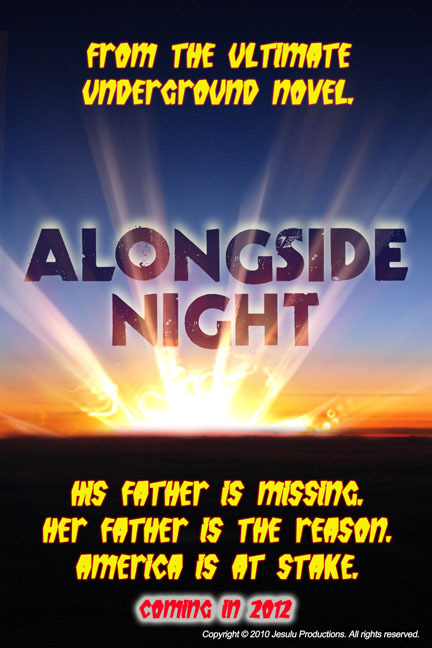 The official Alongside Night Facebook Page is at http://www.facebook.com/alongsidenightmovie. Information about Life Enhancement Products can be found on the web at http://www.life-enhancement.com/movie. Everybody knows that new-media distribution of movies to digital devices will become a major part of film distribution, but to this point nobody has demonstrated a business model that creates a revenue stream sufficient to repay film investors competitive to traditional distribution models that have already shut out all but a handful of independent films. If the cutting-edge Lady Magdalene’s/Life Enhancement business model of free distribution with infomercials works to create such a revenue stream, suddenly independent filmmaking becomes attractive to investors again and for the first time enables competition to traditional distribution channels monopolized by the interlocking cartels of movie studios, broadcast/cable/satellite systems & networks, and chain theatrical exhibitors. (OpenPress) November 6, 2011 — The triple-film-festival-award-winning suspense comedy, Lady Magdalene’s, starring the original Star Trek‘s Lt. Uhura, Nichelle Nichols, has just been released for free viewing on both YouTube and broadcast television, including an up-front infomercial by the nutritional supplement company, Life Enhancement Products. The strategic business alliance between Life Enhancement Products and the independent film company, Jesulu Productions, demonstrates a new distribution model for independent films, whereby the new revenue stream created by the movie’s sponsored distribution is shared with a film’s producer, repaying movie investors for the costs of production. This business model for sponsored independent film distribution was conceived by Lady Magdalene’s writer/producer/director, J. Neil Schulman, also an award-winning novelist and journalist, who in the 1980’s and 1990’s founded and operated two eBook publishing companies, SoftServ Publishing and Pulpless.Com, which were the first companies to make books by bestselling authors available for download to personal computers, first as SoftServ in 1990 via the General Electric Network for Information Exchance (GEnie), then beginning in 1995 from the world wide web as Pulpless.Com. 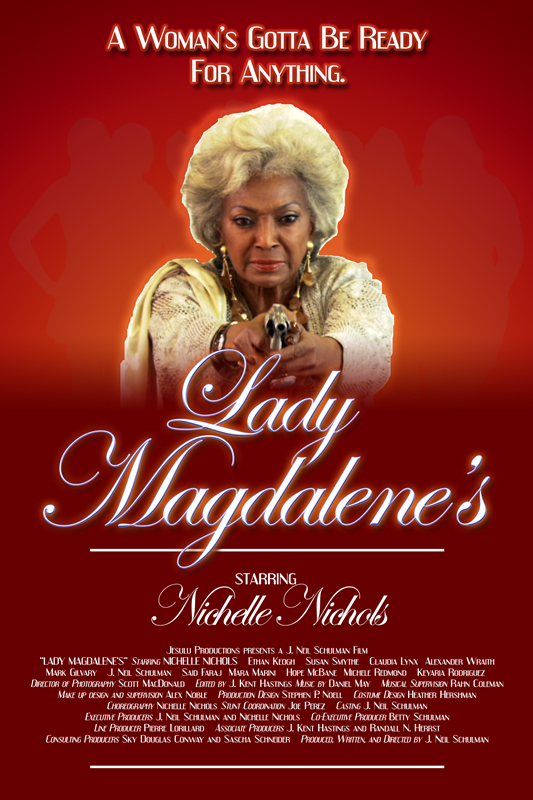 In this suspense comedy, Lady Magdalene’s, Nichelle Nichols plays Lady Magdalene, the colorful and determined madam of a legal Nevada brothel — relocated from New Orleans after Hurricanes Katrina and Rita — and in tax default to the IRS. However the talented but disgraced federal agent, Jack Goldwater (Ethan Keogh), sent as the federal receiver to manage the brothel, soon uncovers evidence that Lady Magdalene’s is being used by al-Qaeda operatives as a meetup for a plot leading to the tunnels under Hoover Dam. But Agent Goldwater and a female federal agent he soon meets up with (Susan Smythe) can’t figure out what al-Qaeda is really doing until they seek help from Lady Magdalene and the working women at the brothel. Full information on Lady Magdalene’s is on the official movie website at http://www.ladymagdalene’s.com. The official Lady Magdalene’s Facebook Page is at http://www.facebook.com/ladymagdalenes.